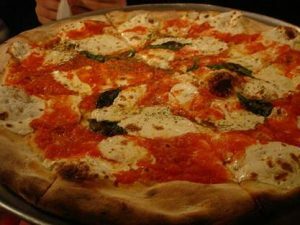 Grimaldi’s is a pizzeria that persists with the 100-year long pizza making traditions, which includes usage of a coal brick oven, rather than a convection oven. The coal brick oven gives a smoky taste to the pizza, and the crisp crust gives diners the unique pizza experience they have never had anywhere else. Besides this, their fresh ingredients add to the overall unique taste that diners relish. They use clean coal from Pennsylvania, and the water is tested for its purity to make their signature dough for their distinctive pizzas. Smoky-flavoured, crisp crust pizza made in a coal brick oven, combined with fresh dough, mozzarella and other ingredients. How long do you have to wait to be seated? How long do you have to wait get your food? A few alternative cheap NY restaurants are Whitmans, Keste Pizzeria and Lombardi’s pizzas. We guide British visitors to get the most out of their vacation in New York. The idea is to give insight to hotels, flights, restaurants and what to do in New York. © Copyright 2005-2019 NY.co.uk All rights reserved.